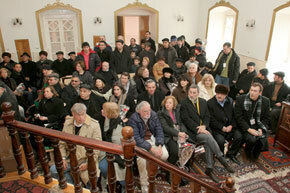 The Azerbaijani and Jewish peoples have a long tradition of tolerance and interaction. Today´s friendly relations between the Republic of Azerbaijan and Israel are built on centuries of shared Jewish-Azerbaijani existence. Alexander Murinson looks at the history of Jews in Azerbaijan, a history that dates back to Nebuchadnezzar and the fall of Jerusalem. Ancient peoples with different religions coexisted for centuries on the territory of modern-day Azerbaijan, a result of the conjuncture of history and Azerbaijan´s position at the crossroads of many trade and strategic routes. The majority of the current population of Azerbaijan belongs to the Shia branch of Islam. But throughout its multi-faceted history, Azerbaijani society experienced the influences of different religious movements such as Zoroastrianism, Christianity, Buddhism and Judaism. The history of multiple military conquests of the territory and religious pluralism led to a great popular tolerance towards peoples of other faiths and assimilation of different religious traditions. Due to its multi-ethnic character, Azerbaijani society today inherits a legacy of tolerance and hospitality towards many ethnic groups and r>eligious confessions. Jews, who experienced many waves of persecution in the Persian Empire and later in imperial Russia and the Slavic regions of the Soviet Union fled to this land of asylum at the imperial frontier. According to historian Mammedov Azerbaijan "was a unique place where the Jews were enabled to preserve their religion and their identity." In particular, in the last three centuries, Azerbaijan provided a welcome place of refuge for Persian and Russian Jews. This atmosphere of prosperity and tolerance, which Jews throughout history experienced in Azerbaijan, should be contrasted with the intolerance of the societies to the north, Russia in general, and Dagestan in particular, and neighbouring Armenia. A Canadian Immigration and Refugee Board Documentation Centre report quotes a former Jewish resident of Baku stating in January 1992 that Azerbaijan, of the former Soviet republics, is "perhaps the best place for Jews to live". The historical memory of amicable treatment, popular acceptance and an absence of anti-Semitism even today affect the perceptions and dispositions of foreign policy elites both in Israel and Azerbaijan towards each other. This perception is shared by the organized American Jewish community, which is influential in some aspects of American foreign policy. population of the ancient Judean kingdom to his northern possessions, which included the territory of Azerbaijan. Emperor Cyrus, the great founder of the Achaemenid Empire (580-529 BC), brought Jewish settlers into his new empire. After the Persian emperor captured the Babylonian possessions in 539 BC, he decreed the return of the Jews to Jerusalem, but a sizable community of Jewish settlers remained. [3 As a result, a significant Jewish Diaspora formed within the boundaries of the Persian Empire. At the same time Persians extensively utilized the cultural, legal and administrative traditions of the conquered nations in their empire building. Some Jewish subjects joined the bureaucratic and economic elites of Persia, which included Media (653-625, modern southern Azerbaijan) as its northern frontier. An important historical source, the Murashu family documents from Babylonia (the present-day Iraq), which date back to the 6th century BC, describes the activities of Jews in the region. These documents contain evidence that Jews were active in renting agricultural land and other possessions of the Achaemenid throne and of members of the Persian royal family. Under Shapur I (241-272) the Sassanid authorities allowed Jews to establish their communal institutions and adopt formal leadership by an Exillarch or Rosh Ha Gola ("The Head of the Diaspora"). Jewish population centres were also found in the Persian Empire´s provinces of Shirvan and Derbent. Important archaeological proof of the Jewish presence in historical Azerbaijan was provided by the discovery of a 6thcentury synagogue during excavations of Shabran settlement. Other Jewish centres in early medieval Azerbaijan were located in Hoy, Salmas and Tabriz. Islam came to Azerbaijani society with the Arab conquests of Persia and the Caucasus in the middle of the 7th century. In Azerbaijan, the pace of conversion to Islam was uneven. Southern Azerbaijan became a part of the Umar Caliphate in 639. In northern Azerbaijan, the Albanian kingdom at first became a vassal state of the Caliphate, where the predominantly Zoroastrian, Christian and Jewish populations, as Ahli-Kitaba (Peoples of the Book), were forced to pay non-Muslim Jizya tax, locally known as haraj. The Albanian kingdom rebelled against the Arab imposition, so the new caliph, Usman (644-656), sent Arab armies to convert the local population by force. Jews found the stability provided by the Caliphates appealing. During the Abbasid Caliphate (750-803) Jewish settlements were found in the region of Zargelan and Semender (the modern day aul or village of Turki in Dagestan). After the collapse of the Caliphate, Quba-Khacmaz province became part of the Shirvanshah Emirate (799-1063) with its capital in Shabran, a town with a significant Jewish population. 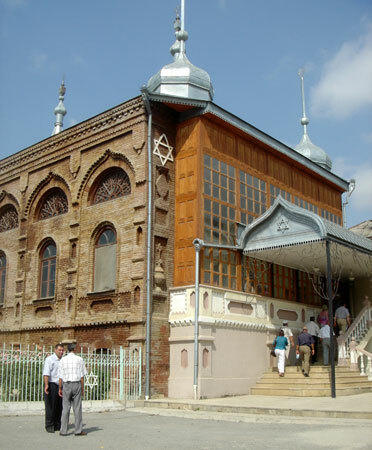 The medieval Jewish community reached the zenith of its influence during the reign of the Il-khanids in Azerbaijan. From the 13th to the 15th centuries Mongolian Il-khans ruled an empire that extended from the Caucasus to the Persian Gulf. It included the present-day Iraq, Iran, Afghanistan and Azerbaijan. Hulegu Khan (1256-65) chose Azerbaijan as the centre of his empire in the second half of the 13th century. During the Il-Khanid dynasty Azerbaijan included the region of Gilan, the cities of Urmiye, Hoy, Salmasa, Maraga and Ushnia, and the Sheki region, including Derbent. All these areas had significant Jewish populations in the 12th century. Under the dynasty, whose early rulers professed Buddhism, Azerbaijan experienced a period of great religious tolerance and a revival of economic activity. The Buddhist Il-Khans attracted Jews into their higher echelons of civil service and bureaucracy. The Jewish ad-Dawla dynasty dominated the political sphere during the rule of the Il-Khanid, Argun Khan (1284-91). His first vizier was Saad ad-Dawla. Saad ad-Dawla controlled both domestic and foreign policy in the empire. His relative, Muhaziim ad-Dawla, was a governor of one of the Il-Khanid capital cities, Tabriz. Later, a Jewish potentate Labid en Abi-IRabi ruled the whole province of Azerbaijan. After the conversion to Islam of Khan Mahmud Ghazan (1295-1304), an anti-Jewish faction rose to power in the Il-Khanid Empire. At the instigation of this faction Saad ad-Dawla was arrested. At the time, a series of Jewish massacres occurred in Tabriz and Hamadan. As a result many Jewish courtiers converted to Islam, including Rashid al-Din Tabib. He was the first vizier in 1298 and served as court historian and geographer under Khan Mahmud Ghazan. Tabib wrote Jamiat Tavarih (The Collection of Chronicles), a compendium of history and geography. His chronicle is one of the most comprehensive sources of Oriental historiography in the Persian language. He was killed on the orders of a Shariah court in 1318. By the 17th century Jewish villages formed a band of settlements from Derbent to Quba. Western travellers attest to a substantial Jewish presence in the eastern Caucasus during that period. During the reign of the Shirvanshahs, the majority of the Jewish population of Azerbaijan concentrated in the Quba-Khachmaz Khanate. After several waves of anti-Jewish persecution and forced conversions in the 16th and 17th centuries, the Jewish population of the Persian Empire dwindled. Fear of persecution led a large group of Persian Jews to resettle in the Quba-Khacmaz Khanate in the 17th century. These Jewish settlers came from Gilan and Tehran. 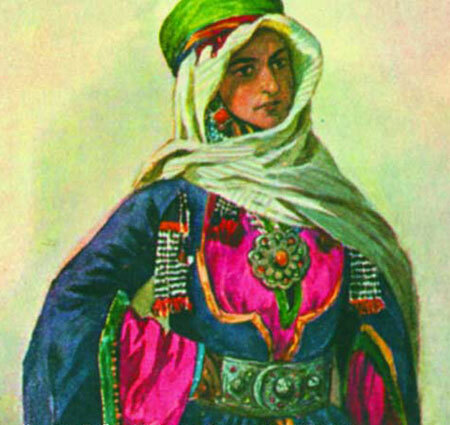 During the struggle for possession of northern Azerbaijan between the Ottoman and Persian Empires, indigenous Jews experienced persecution and destruction of their property by the invading armies. Shortly thereafter, a significant portion of Persianspeaking Jews migrated to the Khanate of Quba during the rule of Huseyn Ali Khan. Jews also fled from Dagestan and other Azerbaijani khanates to seek the protection of the benevolent Huseyn Ali Khan (1711-12). Particularly harsh reprisals against Jews were unleashed by Persia´s Nadir Shah (circa 1736-47.) During this period the Jews established a new Jewish settlement near the Quba Khanate´s capital. Qirmizi Qasaba (Red Colony or Krasnaya Sloboda as it is known in Russian) was founded on the site of the destroyed Jewish town of Kulgat. In 1797 Surhay Khan of the Kazikumyks (from Dagestan) also destroyed another Jewish town, Aba-Saba, in 1797. The Jewish community experienced a true renaissance under the benign rule of Fatali Khan of Quba (1758-89). Fatali Khan provided protection to the Jewish community and attracted numerous Jews from outlying regions of Dagestan, Baku and Gilan. Jewish artisans, silk weavers, gardeners and merchants contributed significantly to the economy of the khanate under his rule. 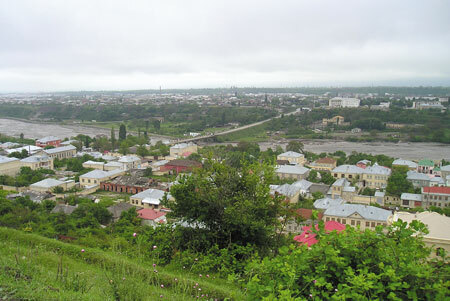 Fatali Khan left an indelible mark of gratitude in the memory of Azerbaijani Jews so that his name is commemorated in the name of the main street of Krasnaya Sloboda, which has survived the Soviet period. The Jews settled in Qirmizi Qasaba and formed particular quarters on the basis of their place of their origin, e.g. Gilan, Tehran, Turkey and Dagestan. mentioned above, the bitter wars between Persia, Turkey and Russia over possession of the northern Azerbaijani khanates in the first half of the 18th century badly affected Mountain Jews in this period. In 1806 northern Azerbaijan was annexed to the Russian Empire (a status that was officially confirmed by the 1813 Treaty of Gulustan). Colonial Russian rule marked a new chapter in the history of Azerbaijan and its Jewish population. This period was characterized by the development of capitalism, westernized ("Russified") education and the integration of the local economy into the international market system. The strong non-Muslim colonial ruler elicited strong reactions from the traditional Muslim religious elites in the Caucasus. Russian settlement in Dagestan exacerbated popular perceptions of foreign invasion and occupation stirred by the more radical interpretation of Islam among Naqshbandiyya, a Sufi tariqate led by Sheikh Shamil. Shamil raised a rebellion of the Murids, his followers, in Dagestan and Chechnya (1834-58). During the anti-Russian Shamil mutiny, which enveloped some regions of northern Azerbaijan, there were numerous bloody attacks on the Jewish population. Shamil practised forced conversion as part of the jihad and thus whole Jewish villages were converted to Islam. The main economic activity of Mountain Jews was agriculture. They were involved primarily in wine-making, forbidden to Muslims, fisheries and medium scale cultivation of madder, the region´s main source of textile dyes. The first Jewish millionaires in Azerbaijan, the Hanukayevs, were major producers and exporters of wine to Russian and Western markets. Another family of local Jewish tycoons, the Dadashevs, also owned wineries and fisheries on the Caspian. During the first oil boom in the 1880s, they owned shipping and dock facilities in Baku. As a result of the development and penetration of Western industrially-produced aniline dyes, the madder growers lost business and turned to small-scale trade or became seasonal workers in Baku and Derbent. The Jews of Azerbaijan excelled in vine growing even during the Soviet period, when they were organized in Soviet collective farms. 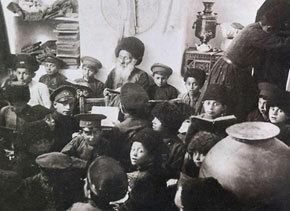 In the 1820s-30s the Mountain Jews established the first contacts with Russian-speaking Ashkenazi Jews and started sending their young to Russian education centres. In the late 19th century, the Mountain Jews became active in the process of the Jewish settlement of Palestine. A delegation of Mountain Jews took part in the Second Zionist Congress in Basel in 1898. Assaf Pinkhasov translated from Russian to Judeo-Persian the book Zionism by Dr Yoseph Sapira in 1903. This book, published in Vilnius, was the first book published in the Tat language. Chisinau (1903) and Kiev (1904) pogroms. The Jewish population, dominated by Ashkenazi, reached 9,689, or 4.5 per cent of the city´s population, in 1913. Among them a number of Jewish prominent oil venture capitalists came to explore the potential of Baku oil. Baron Alphonse Rothschild (1827-1905) came to play a seminal role in the first Caspian oil boom. After his death, ownership of his company passed to his younger brother Edmond. Alphonse Rothschild, the largest banking capital magnate in France, provided a loan for the construction of the Transcaucasian railway that connected Baku and the Black Sea port of Batumi. 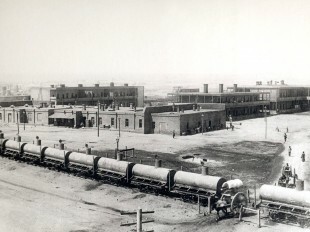 The railway was completed in 1883. This transportation corridor provided access to the landlocked Caspian Sea and spurred a rush of international and Russian investments. As of 1 January 1916, the four main companies that led the Baku oil industry were the Nobel Brothers, the Russian Oil general corporation, the Royal Dutch Shell transnational trust and the Neft financial oil corporation. In 1883 Alphonse Rotshchild founded the Caspian-Black Sea Company (CBSC), which became the leading company of the Baku Oil Council (or the Cartel). The Baku Oil Council was a syndicate of private companies, which were involved in mining, refining and processing oil. As the result of mergers and acquisition of smaller refineries, the Rothschild firm in 1888 supplied 64 million gallons of kerosene, 58.6 per cent of all Russian exports. Jews occupied prominent positions in the Rothschild´s oil concern. Alphonse Rothschild nominated George Aron, a Jewish engineer and a former engineer of the Parisian Rothschild Brothers House, to be the chief technical officer of CBSC. One of the three directors of the company was Moris Efrusy (Àlphonse Rothschild´s son-in-law). The others were Prince A.G. Gruzinskii, and Arnold Feigl, Esq. Such engineers as Kazimir Bardski, Adolph Gukhman, David Landau, M.Fin and I. Pilkevich held management positions in CBSC. Other prominent Jewish oilmen were G.Polyakov of Polyakov and Sons, A. Dembo and H. Kogan of Dembo & Kogan; and Baron Horatio Ginzburg, a member of the Russian Duma until 1892, and a major patron of the arts. By 1913-14 Jewish oilmen controlled 44 per cent of production of kerosene in Baku oil concessions. Kerosene was a principal source of lighting and heating in the first half of the 20th century. In this period, a Jewish chemical engineer A. Beilin made an important technological breakthrough in oil refining technology in Baku. 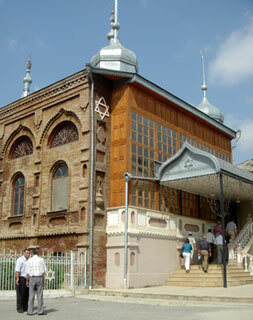 Ashkenazi Jews quickly integrated into the cosmopolitan atmosphere of finde-siecle Baku. Many members of the secularized Jewish community joined the local elite. As an illustration of the prominent status that Ashkenazi Jews attained in Baku, the case of the Landau family deserves some attention. David Landau, a gifted engineer who fled the Kiev pogrom, was promoted by the Rothshchilds to represent CBSC at the Baku Oil Council. Landau produced a number of technical patents in oil refining technology. His wife Lyubov (nee Harkaby) was a medical doctor and had a popular practice. 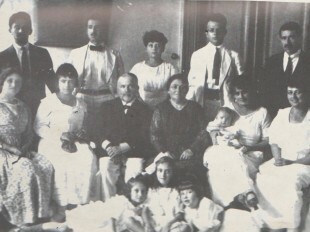 Their son, Lev Landau, born in Baku on 22 January 1908, was a precocious student and was admitted to the Baku Gymnasium. The admission of Jews into the gymnasium was regulated by a Tsarist anti-Jewish five-per-cent quota. This gymnasium had on the Board of Directors, among others, Zeynalabdin Taghiyev and the student´s father, David Landau. After graduating from the Physics Department at Leningrad University at the age of 19, he pursued his scientific career in Ukraine, Germany, Switzerland, England and, especially, in Copenhagen under Niels Bohr. For his contributions to nuclear physics, Lev Landau was awarded the Nobel Prize in 1962.
life of the young republic as members of Zionist and other movements. 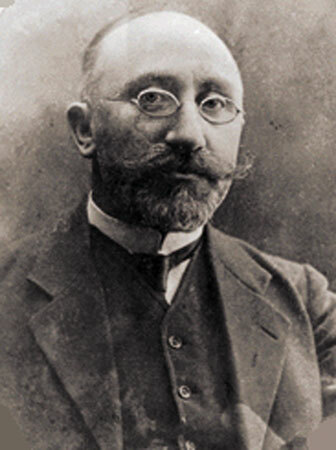 During this short-lived Azerbaijani republic, a Jewish member of the Milli Majlis or parliament was Moisey Gukhman, the son of a CBSC engineer. Some Jews became ministers in the government of the first democratic republic in Asia. K. Lisgar was minister for food provisions, R. Kaplan was minister for religious affairs, Y. Gindes, was minister for health, and M. Abesgauz was deputy minister at the Treasury. A Zionist activist A. Bushman was an elected member of the Majlis. Three Jewish Russian-language publications Kavkazskiy Yevreyskiy Vestnik, Palestina and Molodezh Siona were widely circulated in Azerbaijan. During the Russian Civil war (1918-20) many Jewish refugees from Ukraine and Belorussia came to Baku. They were forced to flee by the massacres of the Jews instigated by the Ukrainian nationalist Symon Petlura and the Russian General Denikin. By the time the Red Army entered Baku in April 1920, its Jewish population had reached 137,000. Zionist political and Jewish cultural activities flourished in Azerbaijan for a short period between the two world wars. In the 1920s, 200 Jewish families moved to Palestine, while Jewish publications in the Tat language appeared, such as a Baku newspaper Tobushi Sabahi (Dawn). By 1922, all Zionist activities were suppressed by the Soviet authorities and most Mountain Jews were collectivized. They formed several collective farms based on viniculture. By 1927, 250 Mountain Jewish families had joined collective farms. In 1922 a first Soviet-style newspaper Korsoh (The Worker) appeared. In 1948-53 as the result of anti-religious and anti-Semitic campaigns, Tat education in schools was banned and publication in Judeo-Persian was suppressed. The sovietization and Russification of the local population denigrated the role of the Tat language in the social life of Mountain Jews, but some of them preserved it and still used it as vernacular in the family circle. 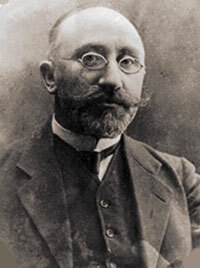 G. Burshtein made an important contribution to the study of Azerbaijani folklore. Jewish musicians taught in the Baku Conservatory. They educated a whole generation of Azeri composers such as Tofiq Quliev, Gambar Huseynov, Farhad Badalbeyli and Zakir Bagirov. By 1959, 29,716 European and 13,000 Mountain Jews lived in Azerbaijan. It is noteworthy that even under the Soviets, the Jews in Soviet Azerbaijan were not exposed to the widespread discrimination in higher education that was typical in other Soviet republics, especially in the Russian Federation. As a result, the Ashkenazi Jews formed a significant part of intellectual and technocratic elites in Soviet Azerbaijan. During the 1970s-80s Baku became a centre of Soviet chess excellence. A Baku chess school, established by O. Privorotskiy, produced among others Garry Kasparov, a world chess champion. During the twilight years of the Soviet empire, Jewish activism increased in Azerbaijan. An Azerbaijan-Israel Friendship society was organized in 1990. Major figures in Azerbaijani culture and academics became board members of this society. The society hosted an Israeli brigadier general, Haim Bar-Lev, and an Israeli minister of energy and science, Yuval Neeman, in 1992. Israel recognized the independence of the Republic of Azerbaijan very shortly after the official dissolution of the Soviet Union. In December 1991 Israel and Azerbaijan concluded aviation and technical agreements. This was one of the factors that prompted Turkey to raise bilateral representation to ambassadorial level. 1. Interview with Eljan Mammedov, a son of a popular Azerbaijani writer a historian and journalist of Express newspaper, August 3, 2004. 2. Arye Wasserman, The Jerusalem Post, 4 January 1992, quoted in "CIS, Baltic States and Georgia: Situation of the Jews" (Ottawa, Canada: Immigration and Refugee Board Documentation Centre, July 1992), p. 21. 4. Massoume Price, A Brief History of Iranian Jews (September 2001) Source: http://www.iranchamber.com/religions/history_of_iranian_jews1.php . 7. Azerbaijan in KEE, vol 1, col.57. 8. Bekker, op .cit., p.14. 10. Gorskiye Yevrei (Mountain Jews) in KEE, vol 2, col.183. 14. Igrar Aliyev, op .cit., p.281. 16. Gorskiye Yevrei, ibid., col. 187. 21. Mir-Yusif Mir-Babayev, op. cit. 24. See discussion of the growth of Baku in Rahman Badalov, Baku: Gorod i Strana (Baku: City and Country) in Dmitry, Furman, op. cit. 25. 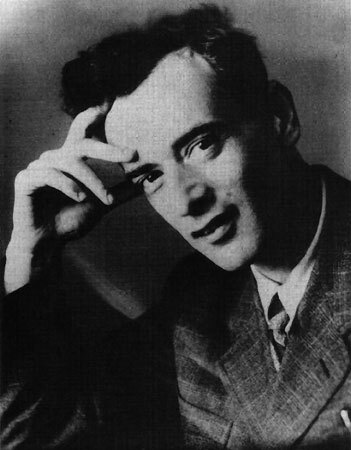 See Lev Landau´s Nobel Prize Winner biography Source: http://nobelprize.org/physics/laureates/1962/landau-bio.html; Despite his arrest during the Stalinist purges, Lev Landau took an active part in the Soviet nuclear bomb project. For his work on the Soviet atomic and hydrogen bombs Landau was awarded two Stalin Prizes (1949 and 1953, respectively) and a Hero of Socialist Labour award (1954). Gennady Gorelik, Physics Today, May 1995, p. 11-15. 26. Bekker, op. cit., p.37. 28. Gorskiye Yevrei, in KEE, vol 2, col.184. 31. Personal communication with Boris Trepnin, 12 February 2004. 32. George Gruen, Turkey´s Relations to Israel in Studies on Turkish-Jewish History (New York: Sepher-Hermon Press, 1996), p. 124.